The Rev. Joseph Lowery, who helped found the Southern Christian Leadership Conference with Martin Luther King in 1957 and led the organization for 20 years, will be the keynote speaker at UCSCs Dr. Martin Luther King Jr. Memorial Convocation on January 10. Lowery, who will discuss Martin Luther King's legacy and the 21st century, will speak at 7 p.m. in the Santa Cruz Civic Auditorium. The event is free and open to the public. 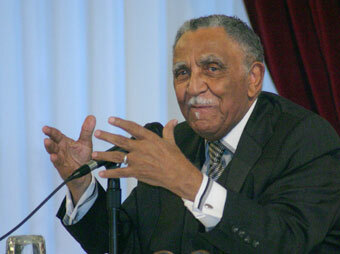 Lowery played a major role in many of the pivotal civil rights struggles of the 1950s and 60s and has remained active. In a case that went all the way to the Supreme Court, Lowery was among four ministers sued by Alabama officials for $3 million in the early 1950s. Lowerys property was seized, but he was vindicated when the court ruled for the ministers in the landmark 1964 libel case, Sullivan v. New York Times, Abernathy, Lowery, Shuttlesworth, and Seay. In 1965, King named Lowery to deliver the demands of a planned Selma-to-Montgomery march for voting rights to then-Alabama Governor George Wallace. In an event that shocked the nation, police tear-gassed and clubbed the peaceful marchers at Edmund Pettus Bridge. The brutality of what came to be known as Bloody Sunday focused the nation's attention on the extreme measures used to prevent black citizens from exercising their constitutional right to vote, leading Congress to enact the Voting Rights Act of 1965. Lowery recalled the 1965 march when he testified before a U.S. Senate committee following the disputed 2000 presidential election. As president of the Southern Christian Leadership Conference from 1977 to 1997, Lowery protested apartheid policies in South Africa and cochaired the 1990 Nelson Mandela visit to Atlanta following Mandelas release from prison. He led a peace delegation to the Middle East and met with the president of Lebanon and Yasser Arafat to seek justice in the Middle East by nonviolent means. Lowery also led protests and was arrested twice in a campaign against the dumping of toxic waste in Warren County, N.C.
Lowery also cofounded the Black Leadership Forum, a consortium of national black advocacy organizations, and served as third president following Vernon Jordan and Benjamin Hooks. After retiring from the Southern Christian Leadership Conference in January 1998, Lowery helped African American farmers secure a federal court decree valued at $2 billion against the Department of Agriculture for discrimination. In 2003, Lowery received an honorary degree of Doctor of Humane Letters from the University of Alabama in Huntsville, one of many such awards from universities around the nation. The Atlanta Board of Education has instituted the Joseph E. Lowery Lecture Series on Civic Participation, and the Atlanta City Council voted to change the name of Ashby Street to Joseph E. Lowery Boulevard. This fall, Lowery was among the first group of honorees included in the International Civil Rights Walk of Fame at the Martin Luther King Jr. National Historic site in Atlanta. Others honored included former President Jimmy Carter, Justice Thurgood Marshall, and Rosa Parks. In addition to UCSC, the annual Martin Luther King Jr. Memorial Convocation is sponsored by the City of Santa Cruz, the Santa Cruz Sentinel, KUSP Radio, Inner Light Ministries, and the Santa Cruz Branch of the National Association for the Advancement of Colored People, or NAACP.